and hard as a rock. 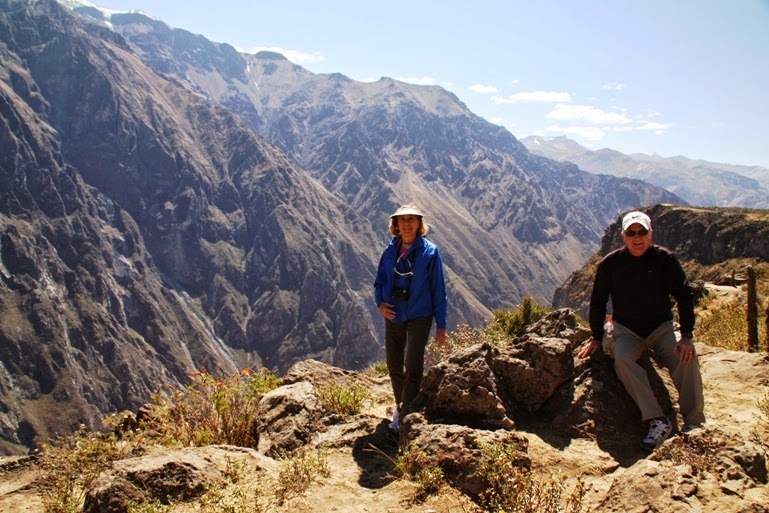 As we continue our day-long drive to Colca Canyon in southern Peru, we ascend higher than 18,000 feet—and the effects of lower oxygen levels are definitely taking effect. When I complain of a headache, our local guide Bernice checks my palms to see of my blood vessels are turning dark. Reassured that this will pass (it does as soon as we start our descent), she points out flora including the jarenta plant, an extremely hard, large green plant resembling a rock. 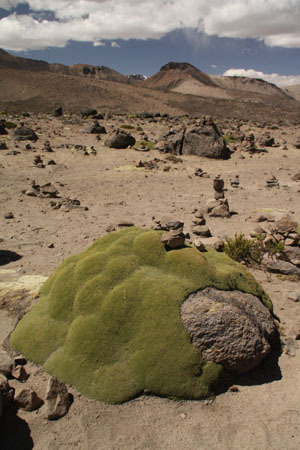 This plant is about 100 years old, growing very slowly in the harsh climate of this high altitude. We pass the “under rocks,” the oldest rocks in the Andes, as well as the caldera of a volcano. Eventually we start descending, driving on a series of “switchback” roads. There’s a fair amount of traffic as we approach Chivay, largest town in the province, on the upper Colca River at the bottom of the canyon. The land is terraced in order to grow crops on the sloping hills. In the 15th century, long before a group of Polish rafters descended to the river on the canyon floor in 1981 bringing it to the world’s attention, the Inca and pre-Inca cultures had developed the area agriculturally with an incredibly complex network of irrigation channels and terraces. These agricultural terraces cover the hillsides even today. Every three to four levels create different micro-climates with specific characteristics for growing crops. 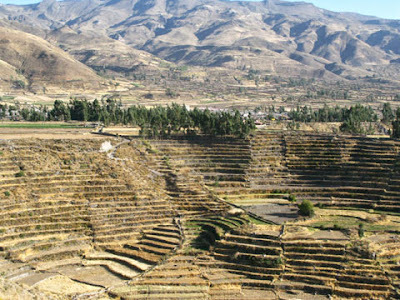 The same terraces are still cultivated on this rugged terrain by the Incas just as their ancestors did. 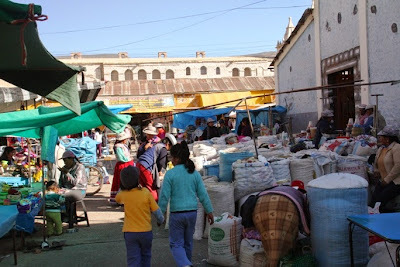 The market in Chivay provides goods and services for local people. We stop to walk through the Chivay market, a sort of supermarket or outdoor mall. Held once or twice a week, people come to buy everything from fresh produce to cooking oil, dish soap, brooms, clothes and shoes---even to get a haircut. The women are dressed in colorful skirts, blouses, and jackets—it looks ceremonial, but it’s what they wear every day. We also take a peek in the church, since that’s the most important building in any of the Highland communities. 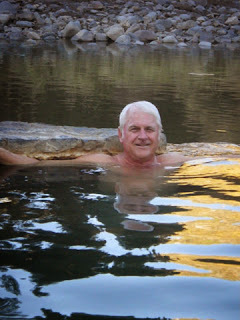 Soon we’re on our way to beautiful, but remote, Colca Lodge, Spa & Hot Springs where we’ll spend two nights. Majestic Andean condors ride the thermals between the canyon walls. 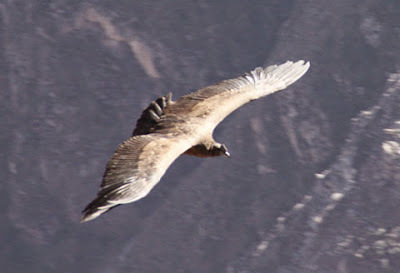 The next morning we rise early and drive to Colca Canyon where we hope to see gigantic Andean condors soaring on the thermal air masses that develop between the 10,000-high canyon walls. Almost twice as deep as the Grand Canyon, Colca Canyon’s grandeur comes from rock towers that go on for miles, thermal springs, and giant birds like the condors sailing overhead. We hiked along the rim of the canyon. Colca Canyon Lodge and Spa. With each excursion we appreciate the area’s charm and uniqueness even more: Alpacas, llamas and herds of wild vicuñas populate the terrain, while Incan ruins, quaint Franciscan churches and small indigenous towns perched on canyon rims reveal the history of Peru. We spy overnight hikers on a ledge on the opposite canyon wall but are grateful that we can return to our lodge after our own modest hike and a relaxing soak in the hot springs there.